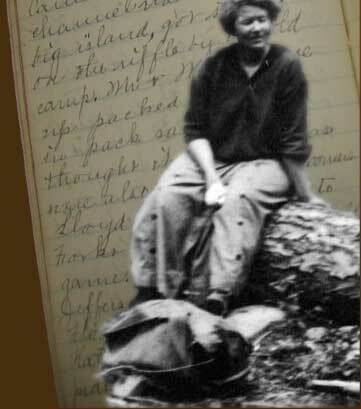 The diaries of Fannie Taylor, written from 1914 to 1922 have been preserved and donated to Olympic National Park by Doreen Taylor. Fannie was a strong independent woman, who had taught Indian school at LaPush, Washington and Fort Defiance, Arizona. At Mora she operated the store and overnight accommodations, as well as the post office. In her diaries Fannie describes the day to day activities of community life at Mora, as well as the vivid descriptions of her home at Taylor Point, or “the ranche” as she called it. She also kept a commentary of interactions with road builders, miners, neighbors, Quileute and non-Indians, the stage and mail drivers and the occasional tourist. Fannie was an excellent photographer, and her photos, combined with her journal entries, are a wonderful portrait of the time period. This project, however gratifying, is fraught with unanswered questions, as Fannie's journal entries only span a brief time period, and her photos are unlabeled--although they are numbered for an index system, the index itself has not been found. We have endeavored to identify the photos from information in her journals, supplemented by archival documents from the National Archives, Bringham Young University, Sequim Museum and Arts Center, as well as many local residents. Unfortunately, it seems that all those who would have remembered Fannie are now gone. The information available is still tremendous, and it is with a reverence for Fannie E. Taylor that we have brought these photos and words to the reader in order to portray a time capsule of life at Mora, Washington in the early 1900s.